A light-emitting diode (LED) is a semiconductor light source. 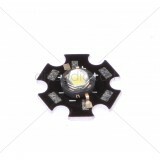 LEDs are used as indicator lamps in many devices and are increasingly used for other lighting. Appearing as practical electronic components in 1962, early LEDs emitted low-intensity red light, but modern versions are available across the visible, ultraviolet, and infrared wavelengths, with very high brightness. High Flux LEDs, sometimes called Superflux LEDs or Pirahna LEDs are able ..
PANASONIC - LED Red Diff 2mm Round Through Hole Specifications: Category: Opto..
SunLED - LED Ice Blue Diff 5mm Square Through Hole Specifications: Category: O..